Virtual Reality is a modern technology that is used widely lately. It has many uses in different situations. One of them is Cultural Heritage. Virtual Reality is proven to be beneficial for the preservation of Cultural Heritage through the applications that are using it, as it can attract a lot of people, even children. In most cases, Virtual Reality applications that are related to Cultural Heritage are about exploring a virtual museum or monument. But what if can be used to simulate a procedure that can be split in actions, in a gamified way? What if this procedure was the restoration of an archaeological site? This procedure is simulated as a series of action, in a gamified way that supports error tracking, holographic representations and visual guidance in order to help the users understand what to do quickly. A sophisticated analytics engine monitors every action in the virtual environment to present a detailed report at the end of the session. Finally a cooperative mode is also supported for users to join in the same virtual room and work together on the restoration-reconstruction of the archaeological site. In this work, an innovative way of using Virtual Reality for the preservation of Cultural Heritage is presented, in which the construction and the restoration of an archaeological site is simulated. It is a very promising idea, as it combines education with entertainment. The users that complete this simulated procedure will have learned about the buildings that are located in the specific archaeological site, since they built them and also they might want to try the application again in the future, in order to improve their score, which was generated through the analytics engine depending on their progress. 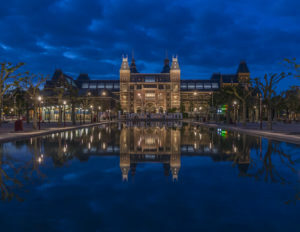 This is very important for the preservation of Cultural Heritage, because that way, in case such an application is installed in the museum, the users will visit the museum again. That way, they will be able to retain even more knowledge from their additional visit(s). The users can interact with the objects in the virtual world by using the controllers of the VR device. 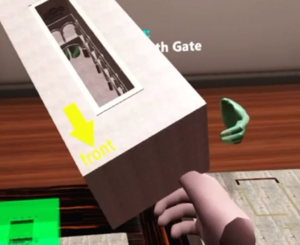 Through the virtual reality device, they can see their virtual hands, which correspond to the two controllers of the device. They have the ability to interact with both hands simultaneously as this application supports physical multiple objects interaction. In this specific application, the construction of Knossos  is simulated, but it can also be extended to support more monuments in the future. 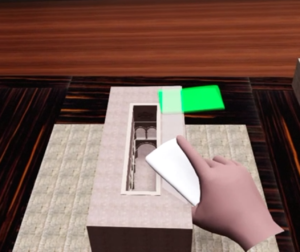 The users can pick up the indicated parts of Knossos, for which holographic representations are used to guide the users to the correct parts, and place them in the correct positions, again indicated by the use of holographic representations. In case the users make an error, it is indicated in the application by applying temporarily red color to the area of the error. The actions have a specific order according to which they must be executed in order to achieve the desired result. In the end, the analytics of the user session are presented with the ability to be saved. Finally, more than one users can join the virtual room, in order to cooperate reconstruct the building at the same time by helping each other or with the guidance of an expert. Figure 1. Interacting with multiple objects at the same time using both hands. Figure 2. Holographic representations guiding the user. Figure 3. The user passes an object to another user in cooperative mode. Figure 4. Through error tracking, the tools turn red when a mistake occurs. Figure 5. The score of the user (analytics engine). In this case study, we presented the an action driven simulation of construction of an archaeological site and how such an application can be used in order to contribute to the preservation of Cultural Heritage. This innovative application combines the concepts of holographic representations, error tracking, cooperation, analytics in a series of actions driven simulation, which can be proven beneficial for Cultural Heritage. Such applications could be installed in museums or even be downloaded and used personally by the users. 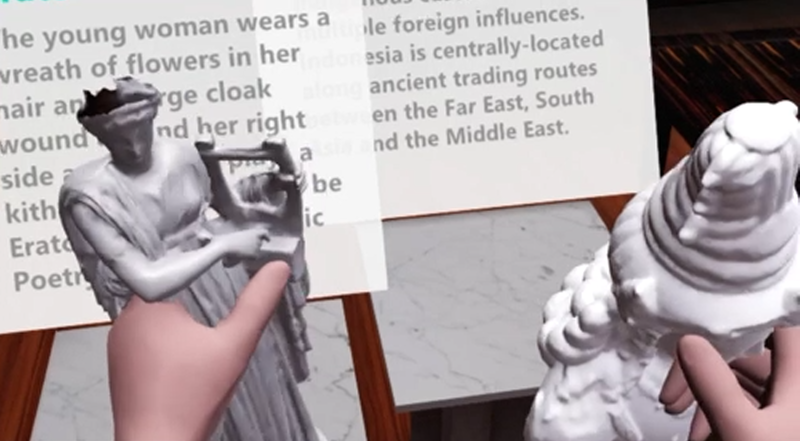 Finally, the combination of this gamified application with the Storytelling and Presence fields  is expected to create the perfect experience for the visitors of Virtual Museums.